In collaboration with EduCluster Finland, subsidiary of University of Jyväskylä, the German University of Technology in Oman (GUtech) offers you a short term training programme on Finnish teaching practices. The programme focuses on knowledge and practical skills for increasing the individual capacity of teachers and educators in the classroom. Finnish education experts will deliver the 3 modules of the programme here in Oman. The programme comprises three (3) modules. 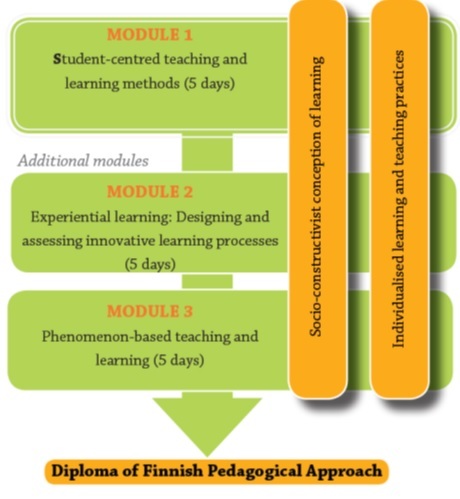 Upon completion of three modules, participants will qualify for a Diploma of Finnish Pedagogical Approach. Module (1) is scheduled on June 11 – 15, 2017. See the brochure (Arabic) or (English) for further details. Much of the success of the Finnish education comes from the focus on students in all levels of education and in all school operations. The most important element of the student-centred approach in Finland is found in curriculum implementation, which focuses on students’ activity and interaction with teachers, other students and the whole school community. From the perspective of the teachers this requires high level pedagogical skills, student-centred working approaches and innovation in learning environments. The module introduces the core elements on how to implement student-centred teaching and learning to bring out the best of each child. Experiential activities are among the most powerful teaching and learning tools available. Experiential learning approach uses learning through reflection on doing and focuses on the learning process for the individual. The use of experiential learning in schools changes the role of the teacher to a learning facilitator and requires a set of new skills, a new mindset and tools. The module will highlight some of the core elements of using experiential learning in schools and in classrooms and supports teachers in testing ways of designing new teaching processes for better results. The Finnish education system aims at broad development of competences and skills sets of students through phenomenon-based teaching and learning approach. The purpose of this approach is to enable the students to see the relationships and interdependencies between different real-world phenomena. It helps students to link knowledge and skills in various fields to structure them as meaningful entities. Competence includes the ability to apply the acquired knowledge in changing contexts and situations, and this is influenced by the students’ attitudes and values as well as their ability to construct knowledge in interaction with others. The module will explore the aspects of the high-quality teacher professionalism in the implementation of phenomenon-based teaching and learning. You would like to enquire about future trainings on Finnish pedagogical approach?